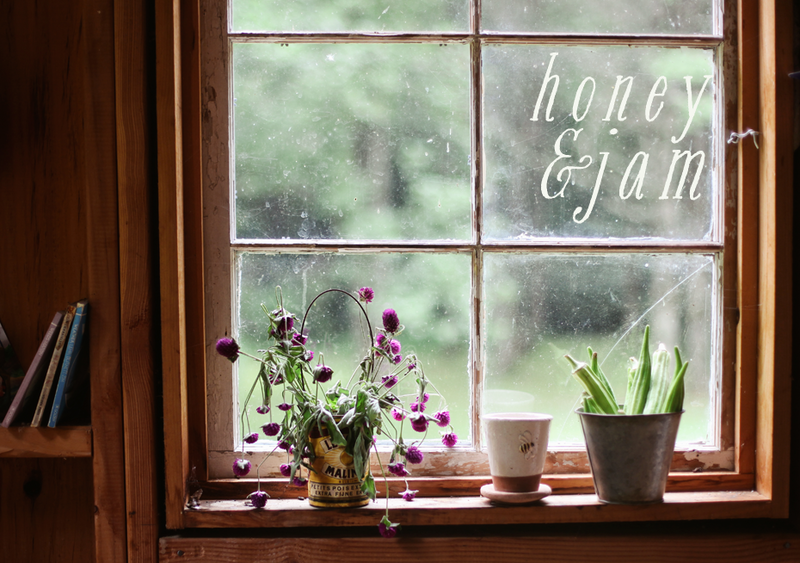 honey & jam | recipes + photos: Mom's Birthday. Today is my mom's birthday and my siblings and I decided to throw her a little party. It was just dinner and cake, but we had fun. I made her a cake using this cake recipe, this frosting recipe (it's her favorite!) and spread some raspberry jam and some frosting in between the layers. 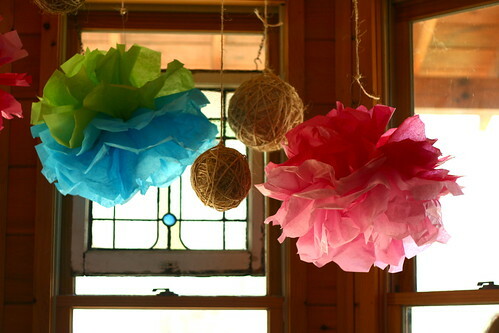 We made decorations using this tutorial for the pom poms and we wrapped some twine around styrofoam balls. My sister and I had a ton of fun making them, and it was so easy. Happy Birthday Mom! You are the best mom anyone could ask for, and I thank God for you all the time. I love you! I found your blog via your LiveJournal (which I clicked on after I saw your wonderful DiTL entry)and I love it! Beautiful pictures, wonderful recipes- thank you for sharing. 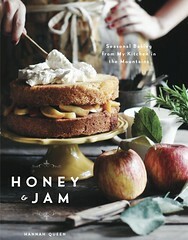 I love honey and jam i eat it everyday and my breakfast is not get complete without it. you are posting blog on my best food. Happy birthday to your mother! How nice of you to bake her a cake, I'm sure it was just as fun for you to do this! Hm.. I kind of want to give that cake a try seeing as you made it twice.. it must be really good! Ya'll are the best kids a mom could have! 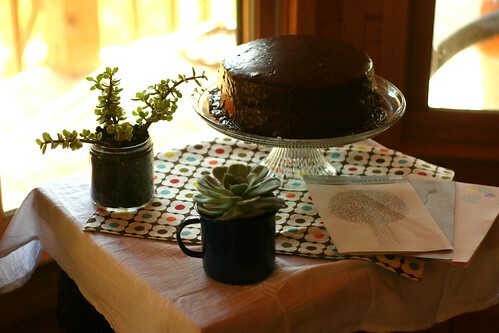 What a sweet post - and the cake looks wonderful. You're getting to be a cake pro!! what a delightful party! any mom would love that. 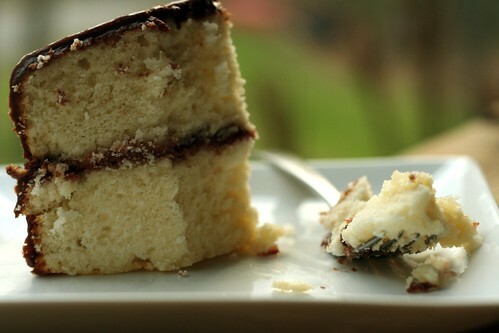 Beautiful cake! Happy Birthday to your Mom. I love those decorations! Sounds like the perfect afternoon. Every time I read a post about your family, I imagine your and yours living on a beautiful farm and being totally self sufficient. Even if it's not true, tell me that it is. It makes my day. Happy Birthday to your mother, Hannah! What fun decorations you and your sister made. Hi Hannah! You don't know me, but I came across your blog and recipes while google-ing for some cupcake recipes. Oh, SO fun! I love it all! Did you print up the letters for the Happy Birthday sign? And the pom-poms! So cute. PS-The cake looked good. Really good. Happy birthday to your Mom. You guys did a great job on her "party"! I just want to thank you. I've used this recipe from your blog maybe seven times. No joke. 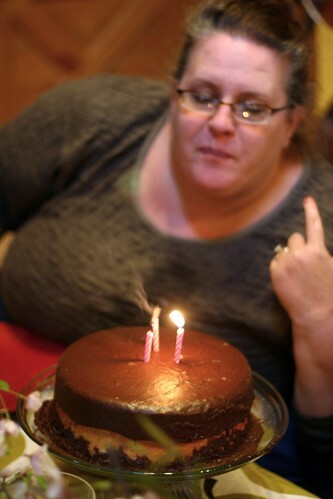 And I deviated yesterday for my boyfriend's birthday cake, and it was a disaster. I promised to bake him a new one (he said I didn't have to of course, but I'm going to - I feel terrible) and am returning to an oldie but a goody. Thank you! Of program, there tend to be bigger mens jackets issues on the line here. Often reproduction handbags tend to be sourced with catier watches techniques which may be dubious, and also the way they are sold implies that women rolex watches tax is actually avoided. This isn't good for that economy. And ultimately, if everyone buys inexpensive replica cheap christmas gifts rather than the real point, at a few points this the designers might wish to call it quits. This site is awesome. My spouse and i constantly come across a new challenge & diverse in this article. Once again great post. When I entering your blog,I felt this. Come on and keep writting your blog will be more attractive. I am very happy to read this. Appreciate your sharing this best posting. This blog is disseminating valuable information to people who are most concerned of the following issues being targeted by this site. Many certainly will keep coming back to check out updated posts. In a large bowl, whisk together the ateş ve su buz devri brown sugar, melted butter, flour and salt. Add in the eggs, maple syrup This dish is really amazing to eat.As there has been mixed many awesome ingredients kaktüs adam so it should be delicious for everyone.I would like to make this dish and will eat with my family. Oh! So nice. You did really so wonderful job. You have posted very informative thing. I am excitedly waiting for you next post. This is exactly what I was looking for. Thanks for sharing this great article! Wow amazing, Nice content I found so many interesting stuff in your blog especially its discussion Thanks to sharing thanks! ADRO TEXTILE Konveksi Murah Indonesia – Tlp 081362666444 ! Hi, it's good to be here... please visit my blog..